Brilliant independent record label Sunrise Ocean Bender presents a stunning collection of seven tracks by Sicily-based psychedelic explorer JuJu (Lay Llamas, Herself). The album’s penned in for release on May 6th 2016. 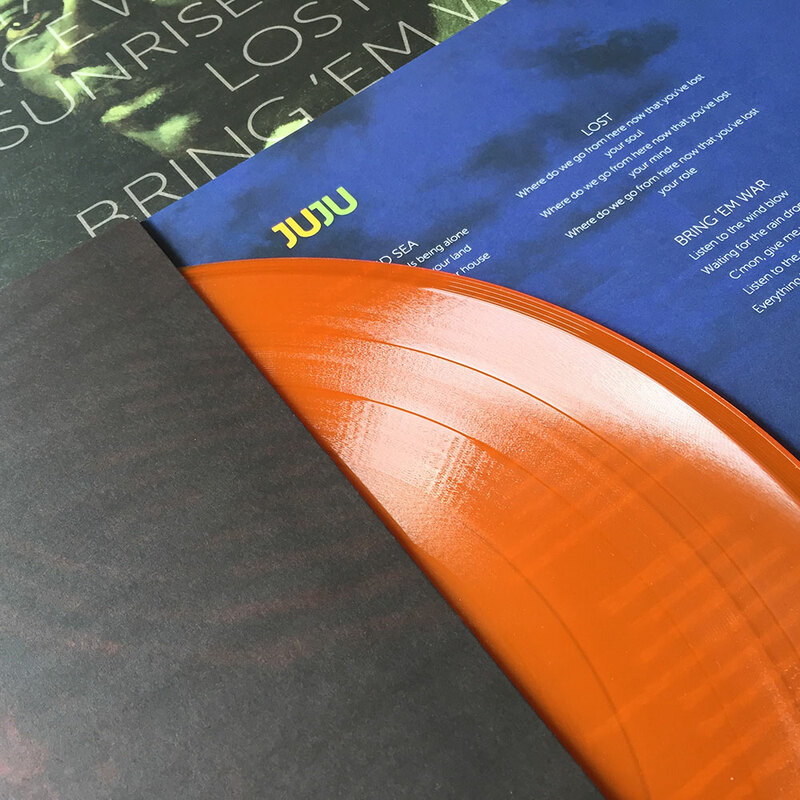 With a stunning sound that’s more akin to a pulsating, living organism, ‘JuJu’ transcends this modern-day psych-rock plain, bringing with it swathes of rhythmic, almost ritualistic, golden frequencies to the ears of its waiting listenership. The album is available on most formats and can be pre-ordered via the labels website. Driving bass frequencies riding a wave of panned percussive hits usher in track one, the hypnotically atmospheric ‘Samael’. Its sequenced drum patterns swirl within the magical maelstrom as it builds into a whirlwind of reverb-induced vocal lines coupled with pounding drums and intertwined with suppressive droning guitars. It surges through its chord progressions with apparent ease as wave after wave of sonic frequencies batter the senses and block out any outside influence, careering you off its chosen musical path. A stunning entry point into a dynamic world of sonic delight. Track two thunders into the musical arena on a titanic wave of shimmering reverb. ‘We Spit On Yer Grave’ is completely addictive as those plodding synth progressions, cushioning that immense vocal attack, ride a juggernaut of explosive drums, throbbing bass lines and tremulous golden-hued guitars. The metronomic opening bars of ‘Stars And Sea’, my favourite track on this entire release, swerve and move within a translucent world of shimmering suspended animation, as those stunning vocals add an air of atmosphere to proceedings. There’s a subtle but brilliant country chic feel to this track as it meanders its way through peaks and troughs of psychedelic delight. The added Eastern-sounding percussive hits inject weight and balance but soon make way for an absolutely blistering finale as the track takes off into a stunning cacophony of swirling vocals, swerving synth swells and dark driving guitars. Beautiful atmospheric piano hits circumnavigated by dark, oppressive samples announce the arrival of ‘Dance With The Fish’, as immense, psychedelically charged synth swells sonically mimic an apparent underwater scene. It’s a beautiful two-minute sonic aperitif to what comes next! A repetitious guitar progression carefully balances a whispering but effective vocal pattern on its axis as ‘Sunrise Ocean’ builds momentum into a charging musical monolith! The tidal wave of sound expands as those droning guitars arrive and plough through the track’s fuzzy interior with aplomb. Add into the mix those driving, addictive bass frequencies and what we have collectively is an absolutely stunning piece of music. The album’s penultimate track, entitled ‘Lost’, begins with stunning melody courtesy of a repetitive piano sequence. There’s an air of tranquility as the synth swells and drums arrive, adding subtle but firm movement to the track and allowing the vocal samples to loop and arc throughout the reverberating atmosphere. The mood then changes as we shift sonic gears. The drums increase in tempo, and coupled with the arrival of a repetitious guitar progression and shakers, the entire piece swirls within a beautiful sonic whirlwind! The album’s closing piece is simply magical! Swirling bongos, sequenced samples and droning, golden frequencies begin the hypnotic rhythmic mantra as those amazing repetitive vocals shuffle into earshot. ‘Bring ‘Em War’ builds and builds, developing form and shape before unleashing something akin to absolute sonic abandonment! It weaves and bobs throughout and drives a deeply melodic, psychedelic furrow right through the centre of the musical landscape! A truly wonderful closing track to a blistering album.